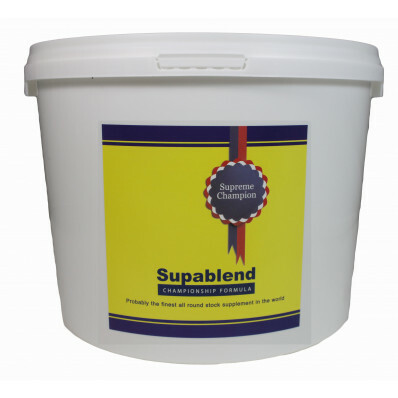 Supablend Championship Formula is an all natural product containing high levels of vitamins, minerals, trace elements and dried herbs to help all round condition and performance. Contains Plantago seed, linseed and Diamond V Yeast on a Nutrimin base. Provides a high intake of nutrients and slows down digestion of feed allowing maximum nutrient utilisation. Helps produce a high health status which in turn produces bette muscling and grading properties alongside more efficient performance. Contains Diamond V Yeast which has well documented digestive and fermentation properties. Helps produce more profitable livestock - ideal for show / sale animals. Suitable for all classes of cattle and sheep, horses, dogs and pigeons. Dried herb extract helps produce calmer, more easily handled animals. Linseed helps produce good shine on coats and clean ended animals. TIP: Use with Codlivit or Ultimate for even greater results.